Lately, the ducks have been taking over. I'd had a Momma Duck in my yard not too happy with my coming over to take a picture of her and her brood a while back. It worked out for the best because I was able to herd them on their way instead of having them land in the pool. Once they know there's water back there, it gets difficult to move a duck family on. But lately it's gotten a bit busy around here. Here being the nearby M.E. DePalma Park in Wilton Manors. I was walking Rack the McNab SuperDog (TM) out that way in the evening when his non existent herding skills came into play. You see, leaving my block, there was a clutch of ducks that we flushed out of the garden in front of my door. When they spotted us open the front door of the house, Momma gathered the brood and walked off into the sunset. I think they ended up in the neighbor's garden. That's where they usually go. I was on the porch anyway giving Rack a "rinse". Dogs get "doggy" smelling after a while, and that rinse keeps his black parts black, the white parts white. We didn't give Momma Duck too much more thought until we hit the more-main street near me. Walking down to the park, there was another brood doing whatever ducks do in the middle of the street. That is, blocking it. This being Florida I'm not surprised when some large woman in an oversized SUV got annoyed. When she was finished pulling out the video camera and getting a few feet of video, she wanted to go. Of course she leaned on the horn. Momma Duck ignored her. Good for Momma. She was there first. Momma Duck was fixated on something else. Rack. 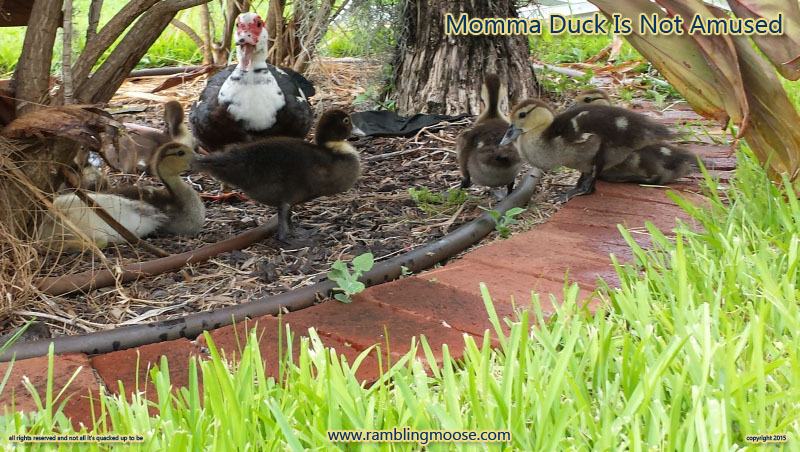 ducks are tried out on Momma Duck and Brood to see how good of a herding dog a Puppy can be, and I suspect Rack is just too Beta of a Beta Dog to try. Momma Duck didn't know that at all. We kept walking closer and Momma had a choice. Leave the street and head into the park, passing my path, or she could walk away from the park and head away. Ducks aren't really the smartest of beasts. Momma first tried to hide under the truck, then walk back to the park, then walk off the street, finally. All the while, I kept walking closer to her with Rack. Rack kept sniffing at everything else, but never really paid the ducks too much attention. 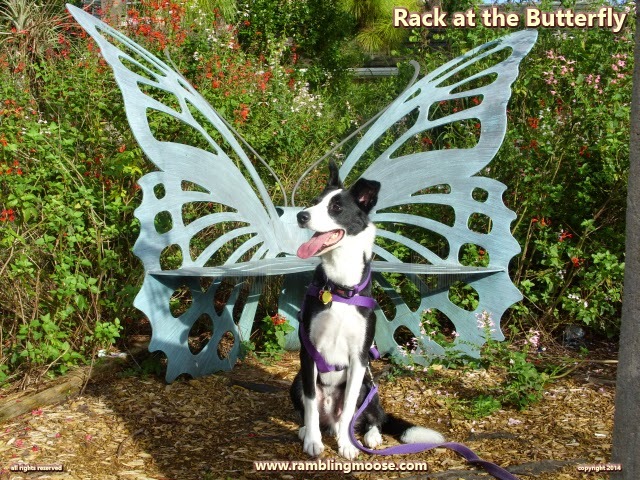 Herding dog, yes, but trained? No. No worries, he had another chance later in the walk. It seems any time these ducks see a herding dog, or a dog in general, they tend to walk away from them. That's what happens here. Walk your dog in the Dog Walk Hour and you end up clearing the streets. It's not about how you herd, it's how good you look while walking the walk!